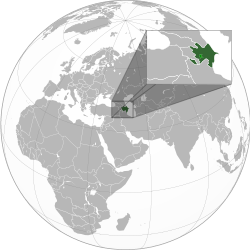 Azerbaijan ( /ˌæzərbaɪˈdʒɑːn/ AZ-ər-by-JAHN-'; Azerbaijani: Azərbaycan), officially the Republic of Azerbaijan (Azerbaijani: Azərbaycan Respublikası) is the largest country in the Caucasus region located at the crossroads of Western Asia and Eastern Europe. It is bounded by the Caspian Sea to the east, Russia to the north, Georgia to the northwest, Armenia to the west and Iran to the south. The exclave of Nakhchivan is bounded by Armenia to the north and east, Iran to the south and west, while having a short borderline with Turkey to the northwest. Azerbaijan is a unitary constitutional republic. It is one of the six independent Turkic states as well as an active member of the Turkic Council and the TÜRKSOY community. Azerbaijan has diplomatic relations with 158 countries and holds membership in 38 international organizations. It is one of the founding members of GUAM, the Commonwealth of Independent States (CIS) and Organization for the Prohibition of Chemical Weapons. A member of the United Nations since 1992, Azerbaijan was elected to membership in the newly established Human Rights Council by the United Nations General Assembly on May 9, 2006 (the term of office began on June 19, 2006). The country is also a member of the OSCE, the Council of Europe, and the NATO Partnership for Peace (PfP) program. Azerbaijan is a correspondent at the International Telecommunication Union and member of the Non-Aligned Movement and holds observer status in World Trade Organization. The Constitution of Azerbaijan does not declare an official religion, and all major political forces in the country are secular nationalist, but the majority of people and some opposition movements adhere to Shia Islam. Relative to other Eastern European and CIS states, Azerbaijan has reached a high level of human development, economic development and literacy, as well as a low rate of unemployment and intentional homicide. On 1 January 2012, the country started a two-year term as a non-permanent member of the United Nations Security Council. The name "Āzar" (Persian: آذر) means Fire and Baijan was originally known as "Pāyegān" (Persian: پایگان) meaning Guardian/Protector. (Āzar Pāyegān = "Guardians of Fire") (Persian: آذر پایگان). Such name roots back to the "Zoroastrianism" era of Persia (Iran); However after the Arab invasion of Persia many Persian words lost their original form as in Arabic there are no letter for pronouncing "G / P / ZH / CH"; Hence "Azar Paigān" came to be known as Azarbaijan. (e.g. The Persian language in Persian is now both known as "Pārsi" (Persian: پارسی) & Fārsi due to the Arab invasion of "Greater Iran" and the great resistance of Iranians around the north. According to an alternate etymology, the name of Azerbaijan derives from that of Atropates, a Persian satrap under the Achaemenid Empire, who was later reinstated as the satrap of Media under Alexander the Great. The original etymology of this name is thought to have its roots in the once-dominant Zoroastrian religion. In the Avesta, Frawardin Yasht ("Hymn to the Guardian Angels"), there is a mention of âterepâtahe ashaonô fravashîm ýazamaide, which literally translates from Avestan as "we worship the Fravashi of the holy Atropatene". Atropates ruled over the region of Atropatene (present Iranian Azerbaijan). The name "Atropates" itself is the Greek transliteration of an Old Iranian, probably Median, compounded name with the meaning "Protected by the (Holy) Fire" or "The Land of the (Holy) Fire". The Greek name is mentioned by Diodorus Siculus and Strabo. Over the span of millennia the name evolved to Āturpātākān then to Ādharbādhagān, Ādharbāyagān, Āzarbāydjān and present-day Azerbaijan. The word is translatable as "The Treasury" and "The Treasurer" of fire or "The Land of the Fire" in Modern Persian. Early settlements included the Scythians in the 9th century BC. Following the Scythians, Iranian Medes came to dominate the area to the south of the Aras. The Medes forged a vast empire between 900–700 BC, which was integrated into the Achaemenids Empire around 550 BC. The area was conquered by the Achaemenids leading to the spread of Zoroastrianism. Later it became part of Alexander the Great's Empire and its successor, the Seleucid Empire. Caucasian Albanians, the original inhabitants of the area, established an independent kingdom around the 4th century BC. During this period, Zoroastrianism spread in the Caucasus and Atropatene. Ancient Azerbaijanis spoke the Old Azari language. The Sassanids turned Caucasian Albania into a vassal state in AD 252, while King Urnayr officially adopted Christianity as the state religion in the 4th century. Despite numerous conquests by the Sassanids and Byzantines, Albania remained an entity in the region until the 9th century. The Islamic Umayyad Caliphate repulsed both the Sassanids and Byzantines from the region and turned Caucasian Albania into a vassal state after the Christian resistance, led by Prince Javanshir, was suppressed in 667. The power vacuum left by the decline of the Abbasid Caliphate was filled by numerous local dynasties such as the Sallarids, Sajids, Shaddadids, Rawadids and Buyids. At the beginning of the 11th century, the territory was gradually seized by waves of Turkic Oghuz tribes from Central Asia. The first of these Turkic dynasties established was the Ghaznavids, which entered the area now known as Azerbaijan by 1030. In 2007, during the construction of a stadium, constructors discovered the Guba mass grave. Studies by Azerbaijani and foreign scientists have confirmed the human remains found there to be of local residents of various nationalities, including Jews and Lezgians who were killed in the 1918 massacre carried out by Armenians. To date, the remains of 600 people have been found, including about 50 children and 100 women. After the collapse of the Russian Empire during World War I, Azerbaijan, together with Armenia and Georgia became part of the short-lived Transcaucasian Democratic Federative Republic. When the republic dissolved in May 1918, Azerbaijan declared independence as the Azerbaijan Democratic Republic (ADR). The ADR was the first modern parliamentary republic in the Muslim world. Among the important accomplishments of the Parliament was the extension of suffrage to women, making Azerbaijan the first Muslim nation to grant women equal political rights with men. Another important accomplishment of ADR was the establishment of Baku State University, which was the first modern-type university founded in Muslim East. The early years of independence were overshadowed by the Nagorno-Karabakh War with neighboring Armenia. By the end of hostilities in 1994, Armenians controlled up to 16 percent of Azerbaijani territory, including Nagorno-Karabakh itself. An estimated 30,000 people had been killed and more than a million had been displaced. Four United Nations Security Council Resolutions (822, 853, 874, and 884) demands for "the immediate withdrawal of all Armenian forces from all occupied territories of Azerbaijan." Many Russians and Armenians left Azerbaijan during the 1990s. According to the 1970 census, there were 510,000 ethnic Russians and 484,000 Armenians in Azerbaijan. In 1993, democratically elected president Abulfaz Elchibey was overthrown by a military insurrection led by Colonel Surat Huseynov, which resulted in the rise to power of the former leader of Soviet Azerbaijan, Heydar Aliyev. In 1994, Surat Huseynov, by that time a prime minister, attempted another military coup against Heydar Aliyev, but Huseynov was arrested and charged with treason. In 1995, another coup attempt against Aliyev, by the commander of the OMON special unit, Rovshan Javadov, was averted, resulting in the killing of the latter and disbanding of Azerbaijan's OMON units. At the same time, the country was tainted by rampant corruption in the governing bureaucracy. In October 1998, Aliyev was reelected for a second term. Despite the much improved economy, particularly with the exploitations of Azeri-Chirag-Guneshli oil field and Shah Deniz gas field, Aliyev's presidency was criticized due to suspected vote fraud and corruption. Three physical features dominate Azerbaijan: the Caspian Sea, whose shoreline forms a natural boundary to the east; the Greater Caucasus mountain range to the north; and the extensive flatlands at the country's center. There are also three mountain ranges, the Greater and Lesser Caucasus, and the Talysh Mountains, together covering approximately 40 percent of the country. The highest peak of Azerbaijan is mount Bazardüzü (4,466 m), while the lowest point lies in the Caspian Sea (−28 m). Nearly half of all the mud volcanoes on Earth are concentrated in Azerbaijan, which was also among nominees for New7Wonders of Nature. Azerbaijan has come under heavy criticism from international bodies such as Amnesty International and Human Rights Watch for its record on human rights: in particular the treatment of homosexuals and the media. The military expenditures of Azerbaijan for 2011 are set at US$4,46 billion. Azerbaijani defense industry manufactures small arms, artillery systems, tanks, armors and noctovision devices, aviation bombs, pilotless vehicles, various military vehicles and military planes and helicopters. Tourism is an important part of the economy of Azerbaijan. The country was a well-known tourist spot in the 1980s, yet, after the fall of the Soviet Union and the Nagorno-Karabakh War during the 1990s, damaged the tourist industry and the image of Azerbaijan as a tourist destination. It was not until the 2000s that the tourism industry began to recover, and the country has since experienced a high rate of growth in the number of tourist visits and overnight stays. In the recent years, Azerbaijan has also becoming a popular destination for religious, spa, and health care tourism. Around 95 percent of the population are Muslims. 85% of the Muslims are Shia Muslims and 15% Sunni Muslims, and the Republic of Azerbaijan has the Second highest Shia population percentage after Iran. In Baku there is the Hindu Fire Temple of Baku ("ateshgah") with an "old" structure which, according to travellers, has been a place of visit for Hindu priests for more than a millennium The place is often "misrepresented as a Zoroastrian fire-temple" due to frequent association of "fire temple" with the Iranian religion of Zoroastrianism. There are some other faiths practiced among the different ethnic groups within the country. By article 48 of its Constitution, Azerbaijan is a secular state and ensures religious freedom. Of the nation's religious minorites, Christians are mostly Russian and Georgian Orthodox and Armenian Apostolic (almost all Armenians live in the break-away region of Nagorno-Karabakh). The official language is Azerbaijani, which belongs to the Turkic language family, spoken in southwestern Asia, primarily in Azerbaijan and Iranian Azerbaijan. Azerbaijani is member of the Oghuz branch of the Turkic languages and is closely related to Turkish, Qashqa'i and Turkmen. The Azerbaijani language is divided into two varieties, North Azerbaijani and South Azerbaijani, and a large number of dialects. Turkic Khalaj, Qashqa'i, and Salchuq are considered by some to be separate languages in the Azerbaijani language group. Azerbaijani served as a lingua franca throughout most parts of Transcaucasia (except the Black Sea coast), in Southern Dagestan, eastern Turkey, and Iranian Azerbaijan from the 16th century to the early 20th century. Azerbaijan made its debut appearance at the 2008 Eurovision Song Contest. The country's entry gained the third place in 2009 and fifth the following year. Ell and Nikki won the first place at the Eurovision Song Contest 2011 with the song "Running Scared", entitling Azerbaijan to host the contest in 2012, in Baku. Plans have recently been revealed for the building of the Azerbaijan Tower. It will reportedly replace the Burj Khalifa as the tallest building in the world with a planned height of 1,050 metres (3,440 ft). The film industry in Azerbaijan dates back to 1898. In fact, Azerbaijan was among the first countries involved in cinematography. Therefore It's not surprising that this apparatus soon showed up in Baku – at the start of the 20th century, this bay town on the Caspian was producing more than 50 percent of the world's supply of oil. Just like today, the oil industry attracted foreigners eager to invest and to work. In 1919, during the Azerbaijan Democratic Republic, a documentary The Celebration of the Anniversary of Azerbaijani Independence was filmed on Azerbaijan's independence day, May 28, and premiered in June 1919 at several theatres in Baku. After the Soviet power was established in 1920, Nariman Narimanov, Chairman of the Revolutionary Committee of Azerbaijan, signed a decree nationalizing Azerbaijan's cinema. This also influenced the creation of Azerbaijani animation. Classical literature in Azerbaijani was formed in 14th century based on the various dialect Early Middle Ages dialects of Tabriz and Shirvan. Among the poets of this period were Gazi Burhanaddin, Haqiqi (pen-name of Jahan-shah Qara Qoyunlu), and Habibi. The end of 14th century was also the period of starting literary activity of Imadaddin Nesimi, one of the greatest Turkic Hurufi mystical poets of the late 14th and early 15th centuries and one of the most prominent early Divan masters in Turkic literary history, who also composed poetry in Persian and Arabic. The Divan and Ghazal styles were further developed by poets Qasim al-Anvar, Fuzuli and Khatai (pen-name of Safavid Shah Ismail I). The acclaimed Book of Dede Korkut consists of two manuscripts copied in the 16th century, was not written earlier than the 15th century. It is a collection of 12 stories reflecting the oral tradition of Oghuz nomads. The 16th century poet, Muhammed Fuzuli produced his timeless philosophical and lyrical Qazals in Arabic, Persian, and Azeri. Benefiting immensely from the fine literary traditions of his environment, and building upon the legacy of his predecessors, Fizuli was destined to become the leading literary figure of his society. His major works include The Divan of Ghazals and The Qasidas. In the same century, Azerbaijani literature further flourished with the development of Ashik (Azerbaijani: Aşıq) poetic genre of bards. During the same period, under the pen-name of Khatāī (Arabic: خطائی for sinner) Shah Ismail I wrote about 1400 verses in Azeri, which were later published as his Divan. A unique literary style known as qoshma (Azerbaijani: qoşma for improvization) was introduced in this period, and developed by Shah Ismail and later by his son and successor, Shah Tahmasp I. Modern literature in Azerbaijan is based on the Shirvani dialect mainly, while in Iran it is based on the Tabrizi one. The first newspaper in Azerbaijani, Akinchi was published in 1875. 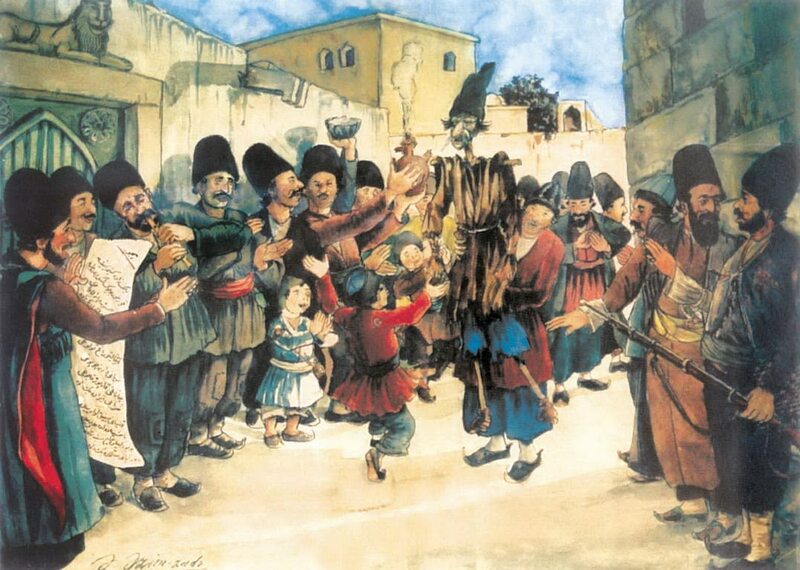 In mid-19th century, it was taught in the schools of Baku, Ganja, Shaki, Tbilisi, and Yerevan. Since 1845, it has also been taught in the University of Saint Petersburg in Russia. Sport in Azerbaijan has ancient roots, and even now, both traditional and modern sports are still practiced. Freestyle wrestling has been traditionally regarded as Azerbaijan's national sport, however today, the most popular sports in Azerbaijan are football and chess. The national football team of Azerbaijan demonstrates relatively low performance in the international arena compared to the nation football clubs. It is mainly because of the foreign footballers playing in the clubs. However, the newly opened Azerbaijan Football Academy in February 2009 is a huge step in the development of the youth football. The most successful Azerbaijani football clubs are Neftchi Baku, FK Baku, Inter Baku, FK Karabakh and Khazar Lankaran. On March 19, 2010, Azerbaijan won the bid to host the 2012 FIFA U-17 Women's World Cup. Futsal is another popular sport in Azerbaijan. Azerbaijan national futsal team reached the fourth place in 2010 UEFA Futsal Championship, while domestic club Araz Naxçivan clinched bronze medals at 2009–10 UEFA Futsal Cup. ^ a b c d "Azerbaijan". International Monetary Fund. http://www.imf.org/external/pubs/ft/weo/2012/01/weodata/weorept.aspx?sy=2009&ey=2012&scsm=1&ssd=1&sort=country&ds=.&br=1&c=912&s=NGDPD%2CNGDPDPC%2CPPPGDP%2CPPPPC%2CLP&grp=0&a=&pr.x=37&pr.y=5. Retrieved April 17, 2012. ^ The Economist. Pocket World in Figures (2012 ed.). Profile Books Ltd. pp. 29. ^ "Human Development Index, 2012 Update". United Nations. 2011. http://hdrstats.undp.org/en/countries/profiles/AZE.html. Retrieved 15 June 2012. ^ Azerbaijan may be considered to be in Asia and/or Europe. The United Nations classification of world regions places Azerbaijan in Western Asia; the CIA World Factbook CIA.gov, NationalGeographic.com, and Encyclopædia Britannica also place Georgia in Asia. Conversely, numerous sources place Azerbaijan in Europe such as the BBC NEWS.bbc.co.uk, Merriam-Webster's Collegiate Dictionary, and Worldatlas.com. ^ Pipes, Richard (1997). The Formation of the Soviet Union: Communism and Nationalism 1917–1923 (2nd ed.). Cambridge, Massachusetts: Harvard University Press. pp. 218–220, 229. ISBN 0-674-30951-0, 9780674309517. ^ a b c d "Azerbaijan: Membership of international groupings/organisations:". British Foreign & Commonwealth Office. Archived from the original on 9 June 2007. http://www.fco.gov.uk/servlet/Front?pagename=OpenMarket/Xcelerate/ShowPage&c=Page&cid=1007029394365&a=KCountryProfile&aid=1019233781986. Retrieved May 26, 2007. ^ Europa Publications Limited (1998). 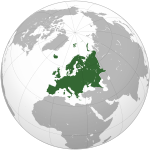 Eastern Europe and the Commonwealth of Independent States. Routledge. p. 154. ISBN 1-85743-058-1, 9781857430585. ^ a b "Elections & Appointments – Human Rights Council". United Nations. Archived from the original on 20 December 2008. http://www.un.org/ga/60/elect/hrc/. Retrieved January 3, 2009. ^ Cornell, Svante E. (2010). Azerbaijan Since Independence. M.E. Sharpe. pp. 165, 284. "Indicative of general regional trends and a natural reemergence of previously oppressed religious identity, an increasingly popular ideological basis for the pursuit of political objectives has been Islam.... The government, for its part, has shown an official commitment to Islam by building mosques and respecting Islamic values... Unofficial Islamic groups sought to use aspects of Islam to mobilize the population and establish the foundations for a future political struggle.... Unlike Turkey, Azerbaijan does not have the powerful ideological legacy of secularism... the conflict with Armenia has bred frustration that is increasingly being answered by a combined Islamic and nationalist sentiment, especially among younger people... All major political forces are committed to secularism and are based, if anything, on a nationalist agenda." ^ "Interactive Infographic of the World’s Best Countries". Newsweek. 15 August 2010. Archived from the original on 22 July 2011. http://www.newsweek.com/2010/08/15/interactive-infographic-of-the-worlds-best-countries.html. Retrieved 24 July 2011. ^ "Seventh United Nations survey of crime trends and operations of criminal justice systems, covering the period 1998 – 2000" (PDF). United Nations Office on drugs and crime division for policy analysis and public affairs. pp. 13–15. Archived from the original on 2006. http://www.google.com/search?q=cache%3Ahttp%3A//www.unodc.org/pdf/crime/seventh_survey/7sv.pdf. Retrieved 2012-05-06. ^ Homicide statistics, Trends (2003–2008) UNODC. Retrieved on 5 May 2012. ^ Houtsma, M. Th (1993). First Encyclopaedia of Islam 1913–1936 (reprint ed.). BRILL. ISBN 90-04-09796-1, 9789004097964. ^ Schippmann, Klaus (1989). Azerbaijan: Pre-Islamic History. Encyclopedia Iranica. pp. 221–224. ISBN 0-933273-95-9, 9780933273955. ^ Minahan, James (1998). Miniature Empires: A Historical Dictionary of the Newly Independent States. Greenwood Publishing Group. p. 20. ISBN 0-313-30610-9, 9780313306105. ^ Chamoux, François (2003). Hellenistic Civilization. John Wiley and Sons. p. 26. ISBN 0-631-22241-3, 9780631222415. ^ Bosworth A.B., Baynham E.J. (2002). Alexander the Great in Fact and Fiction. Oxford University Press. p. 92. ISBN 0-19-925275-0, 9780199252756. ^ Chaumont, M. L. (1987). "Atropates". Encyclopaedia Iranica. 3.1. London: Routledge & Kegan Paul. http://www.iranicaonline.org/articles/atropates-aturpat-lit. ^ Darmesteter, James (2004). "Frawardin Yasht". Avesta Khorda Avesta: Book Of Common Prayer (reprint ed.). Kessinger Publishing. p. 93. ISBN 1-4191-0852-2, 9781419108525. http://www.avesta.org/ka/yt13sbe.htm. ^ Chaumont, M. L. (1984). "Albania". Encyclopaedia Iranica. http://www.iranicaonline.org/articles/albania-iranian-aran-arm. ^ Yarshater, E. (1987). "The Iranian Language of Azerbaijan". Encyclopaedia Iranica. III/2. http://www.iranicaonline.org/articles/azerbaijan-vii. ^ Ludwig, Paul (1998). Proceedings of the Third European Conference of Iranian Studies. 1 (Nicholas Sims-Williams (ed.) ed.). Cambridge: Wiesbaden: Reichert. ISBN 3-89500-070-1, 9783895000706. ^ R. Ward, Steven (2009). Immortal: a military history of Iran and its armed forces. Georgetown University Press. p. 43. ISBN 1-58901-258-5, 9781589012585. ^ Malcolm Wagstaff, John (1985). The evolution of middle eastern landscapes: an outline to A.D. 1840, Part 1840. Rowman & Littlefield. p. 205. ISBN 0-389-20577-X, 9780389205777. http://books.google.com.au/books?id=tcPWhU10mGMC&pg=PA205&dq=safavid+persia+conversion&cd=116#v=onepage&q=safavid%20persia%20conversion&f=false. ^ L. Altstadt, Audrey (1992). The Azerbaijani Turks: power and identity under Russian rule. Hoover Press. p. 5. ISBN 0-8179-9182-4, 9780817991821. http://books.google.com/?id=sZVN2MwWZVAC&printsec=frontcover#v=onepage&q&f=false. ^ Akiner, Shirin (2004). The Caspian: politics, energy and security. RoutledgeCurzon. p. 158. ISBN 0-7007-0501-5, 9780700705016. http://books.google.com.au/books?id=N8IKR0oqdRkC&pg=PA158&dq=safavid+persia+conversion&cd=201#v=onepage&q=&f=false. ^ "In Safavi times, Azerbaijan was applied to all the muslim-ruled khanates of the eastern Caucasian as well as to the area south of the Araz River as fas as the Qezel Uzan River, the latter region being approximately the same as the modern Iranian ostans of East and West Azerbaijan." Atkin, Muriel (1980). Russia and Iran, 1780–1828. University of Minnesota Press. p. xi. ISBN 0-8166-5697-5, 9780816656974. http://books.google.com/?id=swXiVZjonCQC&printsec=frontcover#v=onepage&q&f=false. ^ War, Hunger, and Displacement: Analysis. Oxford University press. 2000. p. 406. ISBN 978-0-19-829739-0. http://books.google.com/books?id=Vv6Q3NIKFP4C. ^ Baddeley, John Frederick (1908). The Russian Conquest of the Caucasus. Harvard University: Routledge. p. 71. ISBN 0-7007-0634-8, 9780700706341. http://books.google.com/books?id=vRyN9YK21v4C&printsec=frontcover&dq=The+Russian+Conquest+of+the+Caucasus#v=onepage&q=Pagina%2071&f=false. "Potto sums up Tsitsianoff's achievements and character as follows: "In the short time he passed there (in Transcaucasia) he managed to completely alter the map of the country. He found it composed of minutely divided, de facto independent Muhammadan States leaning upon Persia, namely, the khanates of Baku, Shirvan, Shekeen, Karabagh, Gandja, and Erivan""
^ Swietochowski, Tadeusz (2004). Russian Azerbaijan, 1905–1920: The Shaping of a National Identity in a Muslim Community. Cambridge University Press. p. 5. ISBN 0-521-52245-5, 9780521522458. http://books.google.com/?id=cozSOSsv7ZsC&printsec=frontcover#v=onepage&q&f=false. ^ King, Charles (2008). The ghost of freedom: a history of the Caucasus. University of Michigan. p. 10. ISBN 0-19-517775-4, 9780195177756. http://books.google.com/books?id=HyJpAAAAMAAJ&q=The+ghost+of+freedom:+a+history+of+the+Caucasus&dq=The+ghost+of+freedom:+a+history+of+the+Caucasus. ^ L. Batalden, Sandra (1997). The newly independent states of Eurasia: handbook of former Soviet republics. Greenwood Publishing Group. p. 98. ISBN 0-89774-940-5, 9780897749404. http://books.google.com/books?id=WFjPAxhBEaEC&dq=The+newly+independent+states+of+Eurasia:+handbook+of+former+Soviet+republics. ^ E. Ebel, Robert, Menon, Rajan (2000). Energy and conflict in Central Asia and the Caucasus. Rowman & Littlefield. p. 181. ISBN 0-7425-0063-2, 9780742500631. http://books.google.com/books?id=-sCpf26vBZ0C&dq=Energy+and+conflict+in+Central+Asia+and+the+Caucasus. ^ Andreeva, Elena (2010). Russia and Iran in the great game: travelogues and orientalism (reprint ed.). Taylor & Francis. p. 6. ISBN 0-415-78153-1, 9780415781534. http://books.google.com/books?id=FfRYRwAACAAJ&dq=%3DRussia+and+Iran+in+the+great+game:+travelogues+and+orientalism. ^ Çiçek, Kemal, Kuran, Ercüment (2000). The Great Ottoman-Turkish Civilisation. University of Michigan. ISBN 975-6782-18-8, 9789756782187. http://books.google.com/books?id=c5VpAAAAMAAJ&q=The+Great+Ottoman-Turkish+Civilisation&dq=The+Great+Ottoman-Turkish+Civilisation. ^ Ernest Meyer, Karl, Blair Brysac, Shareen (2006). Tournament of Shadows: The Great Game and the Race for Empire in Central Asia. Basic Books. p. 66. ISBN 0-465-04576-6, 9780465045761. http://books.google.com/books?id=Ssv-GONnxTsC&dq=Tournament+of+Shadows:+The+Great+Game+and+the+Race+for+Empire+in+Central+Asia. ^ Schulze, Reinhard. A Modern History of the Islamic World. I.B.Tauris, 2000. ISBN 978-1-86064-822-9, ISBN 978-1-86064-822-9. ^ a b c d e f g h "Azerbaijan". World Factbook. CIA. 2009. Archived from the original on 10 June 2009. https://www.cia.gov/library/publications/the-world-factbook/geos/aj.html. Retrieved June 4, 2009. ^ "Azerbaijan: Rise to power". Encyclopedia of the Nations. October 3, 1993. Archived from the original on 10 June 2011. http://www.nationsencyclopedia.com/World-Leaders-2003/Azerbaijan-RISE-TO-POWER.html. Retrieved May 22, 2011. ^ "Azerbaijan's Geidar Aliev dies at 80". "ChinaDaily". December 16, 2003. Archived from the original on 17 December 2003. http://web.archive.org/web/20031217005135/http://www1.chinadaily.com.cn/en/doc/2003-12/16/content_290650.htm. Retrieved December 13, 2003. ^ a b c "Geographical data". The State Statistical Committee of the Republic of Azerbaijan. Archived from the original on 25 May 2007. http://www.azstat.org/publications/azfigures/2007/en/001.shtml#t1_2. Retrieved 2007-05-26. ^ "Azerbaijan's mud volcanoes on Seven Wonders of Nature shortlist". News.Az. Archived from the original on 10 February 2010. http://www.news.az/articles/8581. Retrieved February 8, 2010. ^ a b c d "Climate". Water Resources of the Azerbaijan Republic. Institute of Hydrometeorology, Ministry of Ecology and Natural Resources. Archived from the original on 24 May 2007. http://www.azhydromet.com/SRIH/Water%20Resurs.html. Retrieved 2007-05-26. ^ "Monitors criticize Azeri elections". Al Jazeera. Archived from the original on 11 November 2010. http://english.aljazeera.net/news/europe/2010/11/2010118152810836488.html. Retrieved November 8, 2010. ^ "Combined Average Ratings: Independent Countries 2009". FreedomHouse.org. 2009. http://old.freedomhouse.org/template.cfm?page=475&year=2009. Retrieved 2012-07-10. ^ "The State Statistical Committee of the Republic of Azerbaijan, Administrative and territorial units of Azerbaijan Republic". Azstat.org. Archived from the original on 12 May 2011. http://www.azstat.org/statinfo/demoqraphic/en/001_1.shtml. Retrieved 2011-05-22. ^ Abbasov, Shahin. "Azerbaijan: Baku Can Leapfrog over Ukraine, Georgia for NATO Membership". EurasiaNet. Archived from the original on 6 June 2009. http://www.eurasianet.org/departments/insightb/articles/eav060409.shtml. Retrieved June 3, 2009. ^ Владимир Мухин (January 24, 2011). "Карабахский детонатор на взводе – В Баку и Ереване все четче звучит воинственная риторика". Nezavisimaya Gazeta. Archived from the original on 14 May 2011. http://www.ng.ru/politics/2011-01-24/1_karabah.html. Retrieved May 22, 2011. ^ "Azerbaijan to produce tanks, aviation bombs and pilotless vehicles in 2009". panarmenian. Archived from the original on 9 January 2009. http://www.panarmenian.net/news/eng/?nid=28123. Retrieved December 24, 2008. ^ a b "Azerbaijan – General Information". Heydar Aliyev Foundation. Archived from the original on 5 May 2007. http://www.azerbaijan.az/_Economy/_GeneralInfo/_generalInfo_e.html. Retrieved 2007-05-22. ^ "Top 10 reformers from Doing Business 2009". World Bank Group. Doing Business. Archived from the original on 12 September 2008. http://www.doingbusiness.org/Features/Feature-2008-21.aspx. Retrieved September 28, 2008. ^ "World Economic Forum – The Global Competitiveness Report 2010-2011" (PDF). Archived from the original on 6 December 2010. http://www3.weforum.org/docs/WEF_GlobalCompetitivenessReport_2010-11.pdf. Retrieved 2011-01-04. ^ a b "Azerbaijan – General Information". Heydar Aliyev Foundation. Archived from the original on 28 May 2007. http://www.azerbaijan.az/_Geography/_GeneralInfo/_generalInfo_e.html. Retrieved 2007-05-22. ^ a b c "Azerbaijan – General Information". Heydar Aliyev Foundation. http://www.azerbaijan.az/_Economy/_BankSystem/_bankSystem_e.html. Retrieved 2007-05-22. ^ "GlobalRating / AzeriRating looks at the state of and development trends in the banking sector in Azerbaijan:". RusRating. http://www.rusrating.ru/en/index.php?option=com_content&task=view&id=410&Itemid=31. ^ a b "Natural resources". The State Statistical Committee of the Republic of Azerbaijan. Archived from the original on 10 June 2007. http://www.azstat.org/publications/azfigures/2007/en/003.shtml. Retrieved 2007-05-26. ^ "Azerbaijan: Transportation". Encyclopedia of the Nations. Archived from the original on 18 April 2007. http://www.nationsencyclopedia.com/Asia-and-Oceania/Azerbaijan-TRANSPORTATION.html. Retrieved May 24, 2007. ^ Ismayilov, Rovshan. "Azerbaijan: Baku Boom Has Yet to Hit Regions". EurasiaNet. Archived from the original on 19 August 2007. http://www.eurasianet.org/departments/insight/articles/eav081307.shtml. Retrieved August 12, 2007. ^ "Ministry of Culture and Tourism of Azerbaijan: Goals". Tourism.az. February 6, 2004. Archived from the original on 28 November 2010. http://www.tourism.az/?menu=1&submenu=12&lang=eng. Retrieved January 4, 2011. ^ Zeyno Baran (2005). "The Baku-Tbilisi-Ceyhan Pipeline: Implications for Turkey" (PDF). The Baku-Tbilisi-Ceyhan Pipeline: Oil Window to the West: 103–118. Retrieved on December 30, 2007. ^ "Arianespace signs deal to launch Azerbaijani satellite". News.Az. Archived from the original on 8 November 2010. http://www.news.az/articles/tech/26038. Retrieved November 5, 2010. ^ "Azerbaijan signs deal with Arianespace to launch satellite". Space Travel. Archived from the original on 6 November 2010. http://www.space-travel.com/reports/Azerbaijan_signs_deal_with_Arianespace_to_launch_satellite_999.html. Retrieved November 5, 2010. ^ "Orbital Contracted to Build Azerbaijan’s First Satellite". SatelliteToday. November 28, 2010. Archived from the original on 10 May 2011. http://www.satellitetoday.com/st/headlines/Orbital-Contracted-to-Build-Azerbaijans-First-Satellite_34220.html. Retrieved April 1, 2011. ^ Sohbetqizi, Naila. "Azerbaijan Acts to Limit the Discrimination Against Azeris in Russia". EurasiaNet. Archived from the original on 4 December 2002. http://www.eurasianet.org/departments/rights/articles/eav111102.shtml. Retrieved November 10, 2002. ^ a b "Population morbidity by main diseases groups". The Ministry of Health. Archived from the original on 9 June 2007. http://www.mednet.az/index1en.htm. Retrieved May 27, 2007. ^ "Mapping The Global Muslim Population" (PDF). Archived from the original on 19 May 2011. http://pewforum.org/uploadedfiles/Topics/Demographics/Muslimpopulation.pdf. Retrieved May 22, 2011. ^ "Catholic Church in Azerbaijan". Catholic-Hierarchy. Archived from the original on 29 April 2007. http://www.catholic-hierarchy.org/country/az.html. Retrieved May 27, 2007. ^ "Ethnologue report for Azerbaijan". Ethnologue: Languages of the World. Archived from the original on 18 December 2008. http://www.ethnologue.com/show_country.asp?name=AZ. Retrieved 2009-01-03. ^ Hutcheon, David (September 19, 2008). "Alim Qasimov: the living legend you’ve never heard of". The Times (London). http://entertainment.timesonline.co.uk/tol/arts_and_entertainment/music/article4781720.ece. Retrieved September 19, 2008. ^ Duncan, Ishhad. "The Baku Jazz Festival: Reviving a Tradition in Azerbaijan". EurasiaNet. Archived from the original on 8 May 2005. http://www.eurasianet.org/departments/civilsociety/articles/eav042805.shtml. Retrieved April 27, 2005. ^ "Azerbaijan’s ashug art included into UNESCO list of Intangible Cultural Heritage". Today.Az. Archived from the original on 2 October 2009. http://www.today.az/news/politics/56083.html. Retrieved October 1, 2009. ^ "Azerbaijan wins the Eurovision Song Contest". BBC. May 14, 2011. Archived from the original on 14 May 2011. http://web.archive.org/web/20110514035914/http://www.bbc.co.uk/news/entertainment-arts-13387886. Retrieved May 14, 2011. ^ "The traditional art of Azerbaijani carpet weaving in the Republic of Azerbaijan". Unesco.org. Archived from the original on 5 December 2010. http://www.unesco.org/culture/ich/index.php?lg=en&pg=00011&RL=00389. Retrieved 2011-01-04. ^ a b c "Seyid Imadeddin Nesimi". Encyclopædia Britannica. 2008. Archived from the original on 18 January 2008. http://www.britannica.com/eb/article-9055331/Seyid-Imadeddin-Nesimi. Retrieved 01-09 2008. ^ Babinger, Franz (2008). "Nesīmī, Seyyid ʿImād al-Dīn". Encyclopaedia of Islam. Brill Online. http://www.brillonline.nl/subscriber/entry?entry=islam_SIM-5892. Retrieved 01-09 2008. ^ Michael E. Meeker, "The Dede Korkut Ethic", International Journal of Middle East Studies, Vol. 24, No. 3 (Aug., 1992), 395–417. excerpt: The Book of Dede Korkut is an early record of oral Turkic folktales in Anatolia, and as such, one of the mythic charters of Turkish nationalist ideology. The oldest versions of the Book of Dede Korkut consist of two manuscripts copied in the 16th century. The twelve stories that are recorded in these manuscripts are believed to be derived from a cycle of stories and songs circulating among Turkic peoples living in northeastern Anatolia and northwestern Azerbaijan. According to Lewis (1974), an older substratum of these oral traditions dates to conflicts between the ancient Oghuz and their Turkish rivals in Central Asia (the Pecheneks and the Kipchaks), but this substratum has been clothed in references to the 14th-century campaigns of the Akkoyunlu Confederation of Turkic tribes against the Georgians, the Abkhaz, and the Greeks in Trebizond. Such stories and songs would have emerged no earlier than the beginning of the 13th century, and the written versions that have reached us would have been composed no later than the beginning of the 15th century. By this time, the Turkic peoples in question had been in touch with Islamic civilization for several centuries, had come to call themselves "Turcoman" rather than "Oghuz," had close associations with sedentary and urbanized societies, and were participating in Islamized regimes that included nomads, farmers, and townsmen. Some had abandoned their nomadic way of life altogether. ^ a b İlker Evrım Bınbaş,Encyclopaedia Iranica, "Oguz Khan Narratives" Encyclopædia Iranica | Articles. Retrieved October, 2010. "The Ketāb-e Dede Qorqut, which is a collection of twelve stories reflecting the oral traditions of the Turkmens in the 15th-century eastern Anatolia, is also called Oḡuz-nāma"
^ Minorsky, Vladimir (1942). "The Poetry of Shah Ismail". Bulletin of the School of Oriental and African Studies, University of London 10 (4). ^ "FIFA Executive Committee approves special funding for Chile and Haiti" (Press release). FIFA. March 19, 2010. Archived from the original on 22 March 2010. http://www.fifa.com/aboutfifa/federation/bodies/media/newsid=1183198.html#fifa+executive+committee+approves+special+funding+chile+haiti. Retrieved March 20, 2010. Olukbasi, Suha. Azerbaijan: A Political History (I.B. Tauris, 2011) 292 pages; $90). Focus on post-Soviet era. This page uses content from the English language Wikipedia. The original content was at Azerbaijan. The list of authors can be seen in the page history. As with this Familypedia wiki, the content of Wikipedia is available under the Creative Commons License.